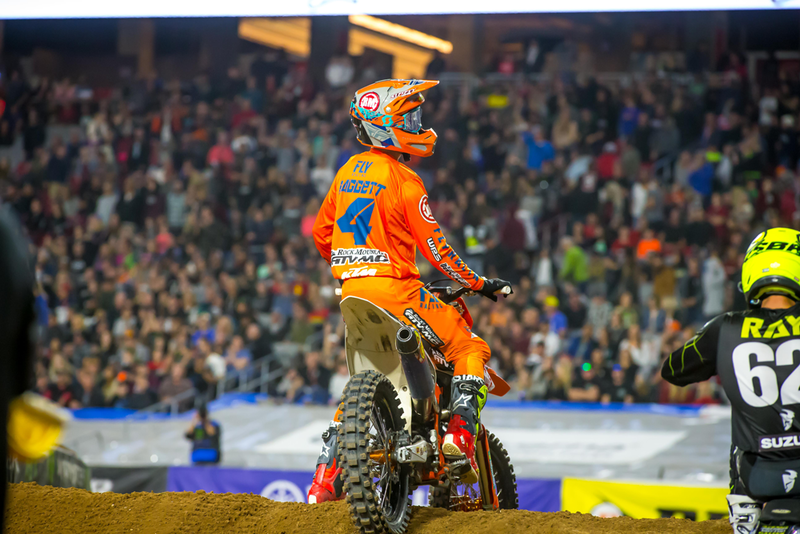 Five years in the making, Rocky Mountain ATV/MC KTM rider Blake Baggett pulled off one of the most memorable wins in recent Monster Energy Supercross history in Glendale! Long touted as one of the fastest riders on the pre season test tracks, Baggett had previously been able to knock down podium finishes, but that first victory had eluded him. At the Anaheim season opener Baggett was the fastest qualifier, but struggled with a bad start and ensuing muddy conditions to post a 12th place finish. In Glendale Baggett was unable to duplicate his quick qualifying effort, but rode well to a 4th place in his 450SX heat race. Blake was riding well, but there really wasn’t a sign that he would be so strong in the 450SX main event! Baggett got a good start and was riding around the top five until the 14 minute mark when the race was stopped for an injured Malcolm Stewart. On the ensuing single file restart, Baggett raced into third and began to apply pressure to the leading duo of Ken Roczen and Jason Anderson. When Anderson and Roczen collided with Ken going down, Baggett began to put down the fastest laps on the track as he pressured Anderson. In a power move, Baggett grabbed a handful of throttle down the straightaway and rocketed past Anderson for the lead on the outside! From there he set sail and pulled away to victory. It was a huge win for team Rocky Mountain ATV/MC KTM and Blake! 2. Jason Anderson: It was a great rebound from his dismal 14th place showing at the season opener. 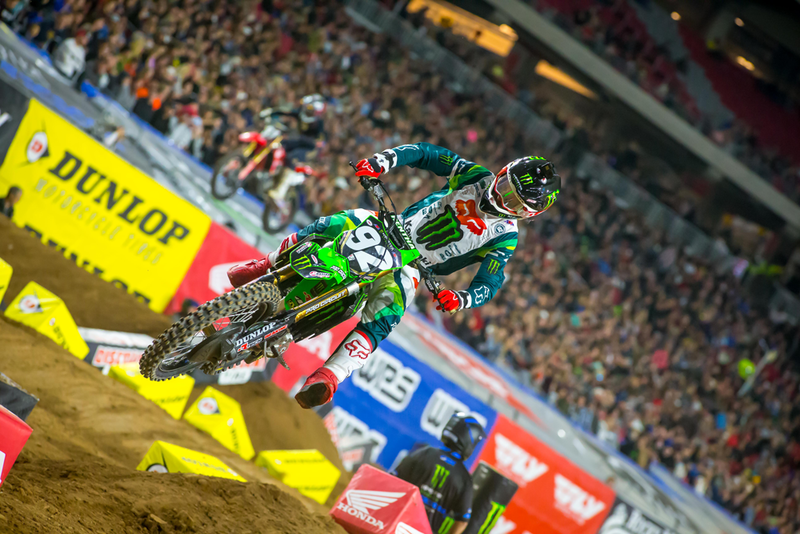 Fast in qualifying and in a position to win the 450SX main event, Anderson showed the speed that took him to the 2018 Monster Energy Supercross title. A win may be coming. 3. Ken Roczen: Oh, what could have been! Roczen holshot the 450SX main event and was riding comfortably in the lead when the race was halted for the downed Stewart. It’s a difficult thing for a racer, especially while in the lead, to regain that rhythm after stopping like that. Unable to shake Anderson, the two made contact in a bowl corner with Ken going down. He would rebound for a strong 3rd place overall. He proved that a win is just around the corner. He will take the red plates into the Triple Crown event this weekend in Anaheim. 4. Eli Tomac: It was a tough evening for Tomac, who never really put down a fast lap in qualifying as was expected, then he had to race the Last Chance Qualifier to make it into the main event. He didn’t get a great start but charged up to 4th and is sitting just fine in the points, only 4 back from Roczen. 5. Marvin Musquin: It was a fairly quiet evening for Musquin. He wasn’t spectacular in qualifying, but won his heat race and was ok in the main event. He looked to struggle with the long whoop section all day. That said, he is still sitting ok in the points only 11 out of the lead. 6. Justin Barcia: Like Musquin, it was a fairly quiet evening for Round 1 winner Justin Barcia. Expect for the aforementioned fireworks between he and Wilson in the heat race, Barcia wasn’t in the top ten in either qualifying session. Still, his 6th place overall has him one point out of the point’s lead heading into Round 3. 7. Justin Brayton: It was a strong night for Brayton who showed speed in qualifying, then won his heat race convincingly. He got a bad start in the main event and rode well to 7th, but showed enough speed throughout the day to prove that podiums and perhaps a win could be in his future. 8. Dean Wilson: Unable to produce the fireworks from his week 1 performance, Wilson still had a respectable evening in Glendale with a solid 8th overall. There were some fireworks between he and Justin Barcia in their heat race, so keep on eye on a possible rivalry between the two in the next couple events. 9. Cole Seely: In his return from a potentially career ending injury in 2018, Seely has come out of the gate with two top 10’s to begin the season. Cole finished runner up in his 450SX heat race and looks to be building speed through two weeks of racing. He could surprise at the Triple Crown next weekend in Anaheim. 10. Cooper Webb: A bad start thwarted his efforts for a great finish in the 450SX main event. Strong in qualifying and 5th in his heat race, Glendale just never offered much luck to the third year 450SX racer. His speed is there, so with a start look for Webb to land a podium soon. It was all Adam Cianciarulo in the 250SX division in Glendale! He broke away early in the main event and pulled out to a sizeable lead to claim a dominant victory. He had some serious competition on speed throughout the day by Monster Energy Star Racing Yamaha’s Dylan Ferrandis. The Frenchman was fastest in both qualifying sessions, but had a spectacular high-side crash in the main event squashing his hopes of victory. Meanwhile, week one winner Colt Nichols rode great all day, winning his heat race and posting a runner up finish. Troy Lee Designs red Bull KTM racers Shane McElrath rounded out the podium. After two rounds there isn’t much that has been proven in the 450SX division! Racers are jumping all over the scoring pylon in qualifying and in the main events it is anyone’s guess. Blake Baggett’s win proved how deep the field is and with the first Round of the 2019 Triple Crown charging our way this Saturday, we probably haven’t seen anything yet!